I had been teaching my PT partner the new technique as it was evolving. At last I could get my own first treatment. A site in my back was located with my new method for core problem detection. His hands applied pressure in the way we had found to be so helpful to others. I felt something in my back wind up like a tight rubber band getting tighter - tighter – tighter…and then it let go. Like something “sprang” loose. Liberated. And all my pain disappeared - sciatic, pelvic – all of it. After so many therapies, It’s been 23 years now of relief. A stuck nerve, a mechanical logic, and a response that liberated it, permanently. I went on to find more ways to detect problems and assist their recovery. My recovery continued as chronic infections, neck problems, and pelvic floor pain yielded to the combined approach and skills of my Access teammates. A self corrective physical process that accesses nearly every type of tissue and reverses the mechanical and molecular behaviors that are perpetuating the problem. An acoustic sensor technology that locates, identifies and indicates the severity of the status and dysfunctions of tissues. The understanding of the tensional relationships of the body tissues as an organism, a system of systems. It is driven by primitive survival reactions which persist, forcing coping mechanisms in the effort to maintain stability and management. Pain and inflammation develop as adverse results and are more recognizable than the processes the source of their irritation. Hands-on, gentle and effective manual therapy techniques, guided by the QRI Assessment findings, assisted by synergistic modalities, trigger body responses for successful reversal and recovery through providing the right support at the right place in the right sequence. The science about the role of tissue and cellular mechanics is already in place. Considerable published research and dedicated university laboratories represent the medical relevance and importance of this field of physiology. The technology I discovered is reliable and has potential to translate this understanding to practical, clinical use in all medical and veterinary areas. It could become the next MRI or ultrasound in its significance to health care. The NeuroAccess self corrective process is reliable and consistent with the physiology. It succeeds in reversing the underlying dysfunctions including when other methods have been unproductive. I am pleased to welcome you to our beautiful Access Health Renewal facility! I'm very proud to offer you new efficient and effective tools and techniques for recovery from pain, injury and dysfunction. I’ve had a lifelong desire to be of benefit to others and help improve the world. It was in my blood coming from a family and heritage committed to being part of the solution. Being able to deliver was more elusive. It’s been a life journey finding such a fascinating and successful expertise and reaching its current capabilities. Through 35 years of practice, discoveries and research and development in therapies and technology, I've been able to create and validate resources that will be valuable here and which will spread globally. My father was an osteopathic physician. It wasn't what he had planned. But the MD program had filled its quota (in1941) for Jewish applicants, and osteopathy welcomed him. He was a general practitioner (now called “family practice”). He handled many needs, and he always applied osteopathic manipulation techniques wherever pain and tension could be relieved directly, without relying on medications. 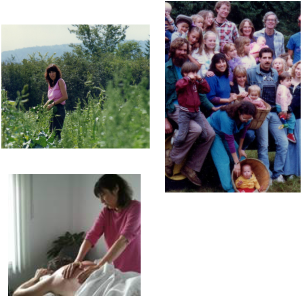 My own journey started with years of being an organic vegetable grower (which had brought me to Maine) and a decade-plus career in midwifery. I was then given the opportunity to help people in pain thanks to someone who appreciated direct methods of helping. I attended a birth for this chiropractor (the baby has grown up to be a rock star, incidentally) and he invited me to provide massage for his clients. I fell in love with the prospect of being able to help people recover from pain. It was a natural transition for me to consider helping people of all ages and types regain health through “midwifing” their recovery process. But I quickly found what nearly everyone who is involved with people in pain know – the goal can seem impossible for many or gained for some only through extensive investments of time and effort (and money!). In addition, my own pain was getting worse. Sciatica had plagued me forever it seemed, despite getting every treatment possible. Even as the top teachers in the bodywork world worked on me, internally or externally, or when I worked to eliminate my childhood traumas, the results were haphazard. Sometimes after sessions I felt better, other times I could barely walk. I wore a lift, I didn’t wear a lift, I consulted healers. Then I had surgery for another problem and couldn’t bounce back. A year of suffering later, I was in my hot tub trying to fix myself late at night. In my experimentation, something I did suddenly produced movement of my body in the water. It turned out that I had stimulated a response of my body that was amplified by the water in which I floated, producing subtle waves. I could make it happen repeatedly. An activity was going on in there, different from anything I had ever experienced as a patient or therapist. I moved to a treatment table. Now gravity kept my external body still. When I did the new maneuver, I could feel my tissues move, in a new way. And because I had studied so many methods and tissue responses, I knew this was different. No one had ever described such a response. I came to understand this as the body’s own process to reverse tension and stress reactions and return to normal. But because it is autonomous – a spontaneous, self directed activity – it cannot be forced. Being trained in many other methods, I realized that since they were based on applying and imposing forces into the body, their maneuvers would obscure this response and the insights it offered. As described elsewhere in this website, the concept is that the problem is like a cramp, and like a cramp or charleyhorse, it has to intensify and get more and more tight until it reaches the end of the cycle of persistent protective reaction. Then it can fully release, reversing the reaction and restoring normal mobility and comfort. In working with patients I discovered that this tissue activity, which I named the Neuro Access Response, could be engaged and promoted by specific manual therapy techniques which I named Access Therapy™. Working with it brought me to discover insight that made difficult, puzzling physical problems logical and understandable. The success in helping people recover indicated I was on the right track. The addition of the modalities for addressing congestion completed these reliable capabilities. Being a farmer introduced me to a consciousness of collaborating with Nature and natural processes. Being a midwife instilled in me an abiding confidence in the body processes being logical, productive and capable. As a nurse I could deepen my role in helping people to restore and maintain their health and well being. Now as a non-academic physicist, engineer, researcher, teacher, healer, and manufacturer, I can open others in their healthcare roles to these new dimensions and put these new tools into their hands to reinvent human and veterinary healthcare. As my patients know, I work tirelessly towards these goals. It’s going to take a whole community to get there, so those interested in participating are welcome to be in touch! Infection, congestion, and other lymphatic problems are deeply present in many cases, hidden from detection, and interfering with therapeutic response. Such stealth organisms and their mechanisms are currently the target of intense scientific study. Our methods succeed because Sonotect™finds the hidden sites and Access Therapy™ eliminates them, while heating, hydromassage, and ozone boost responses in the immune, lymphatic, and circulatory systems.